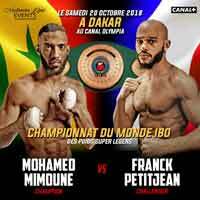 Review by AllTheBestFights.com: 2018-10-20, fight not so exciting between Mohamed Mimoune and Franck Petitjean: it gets two stars. The Ibo super-Lw champion Mohamed Mimoune entered this fight with a professional record of 20-2-0 (2 knockouts) and he is ranked as the No.6 super lightweight in the world (currently the #1 in this division is Josh Taylor). He lost to Alexandre Lepelley in 2013 but since then he has collected nine victories defeating Jussi Koivula, Sam Eggington (Eggington vs Mimoune) and Emiliano Dominguez Rodriguez in his last three (Mohamed Mimoune vs Emiliano Dominguez Rodriguez). His opponent, Franck Petitjean, has a boxing record of 22-4-3 (5 knockouts) and he entered as the No.29 in the same weight class. He lost to Rafik Harutjunjan in 2014 but since then he has collected nine victories and one draw beating Andrea Scarpa (Franck Petitjean vs Andrea Scarpa), Petar Peric and Kakha Avetisiani in 2018. Mimoune vs Petitjean is valid for the IBO World super lightweight title (Mimoune’s first defense). Watch the video and rate this fight!